When Ed McCarthy comes to my apartment for dinner he always brings champagne and it is always very good Champagne. Ed has been doing this for almost 30 years. A few months ago after I poured the Champagne for all my guests, I overheard Ed saying something about the glasses to the person standing next to him. I asked him what he had said and with a smile answered “this is not the right glass for Champagne”. The glass was a flute. I said to Ed “next time you come, bring glasses, too,” and he replied “Ok”. A few weeks later Ed arrived with champagne and eight tulip-shaped glasses. He feels that this is a better glass for champagne. He went on to say that he now prefers to drink champagne out of a white wine glass! Ed is a member of the Wine Media Guild and author of Champagne for Dummies. 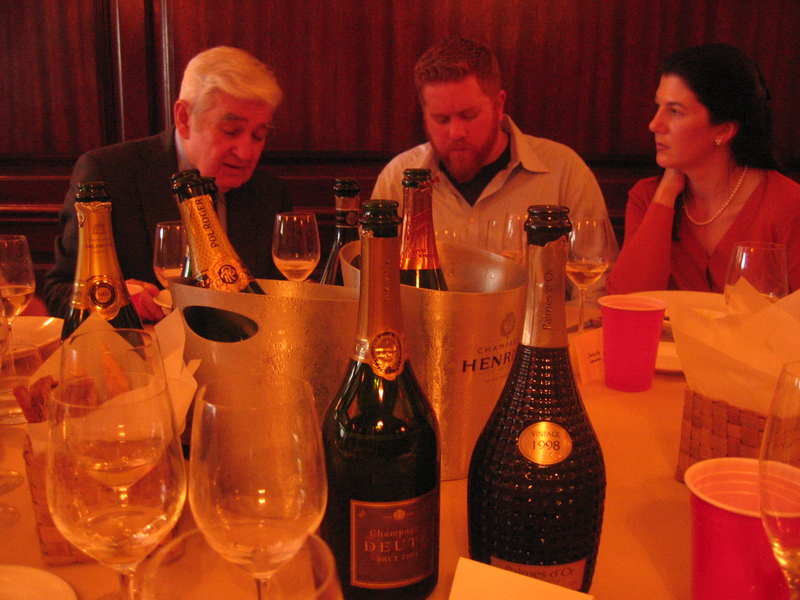 Every year in December he is the speaker for the Wine Media Guild’s champagne tasting and lunch at Felidia restaurant. This year Ed asked for both Champagne glasses (tulip) and white wine glass to be at the tasting so the members could choose which they preferred for the Champagne. Most went with the white wine glass. Following are the Champagnes Ed picked for the tasting and some of his remarks and comments by me. 2000 Ayala Blanc de Blanc, 100% Grand Cru Chardonnay ($ 60-65). Light elegant style, dry. Ed felt it would be great as an aperitif before dinner and a good buy. It had hints of apple and citrus with a touch of toast. I like it with food. 1999 Delamont Blanc de Blancs, 100% Chardonnay Gran Cru ($75-80). Ed said this was the inexpensive sister of Salone and this Champaghe house is a Blanc de Blancs specialist. Ed felt it had more body and fruit than the Ayala. Delamont also makes a great Rose. 1999 Pol Roger Blanc de Blancs, 100% Chardonnay from Grand Cru Vineyards in the Cete des Blancs ($95-$105). Ed believes that this is a great Blanc de Blancs. It was complex and full and one of his top 3 at the tasting and a good buy. I agreed. He also said he loved their Cuvee Winston Churchill. 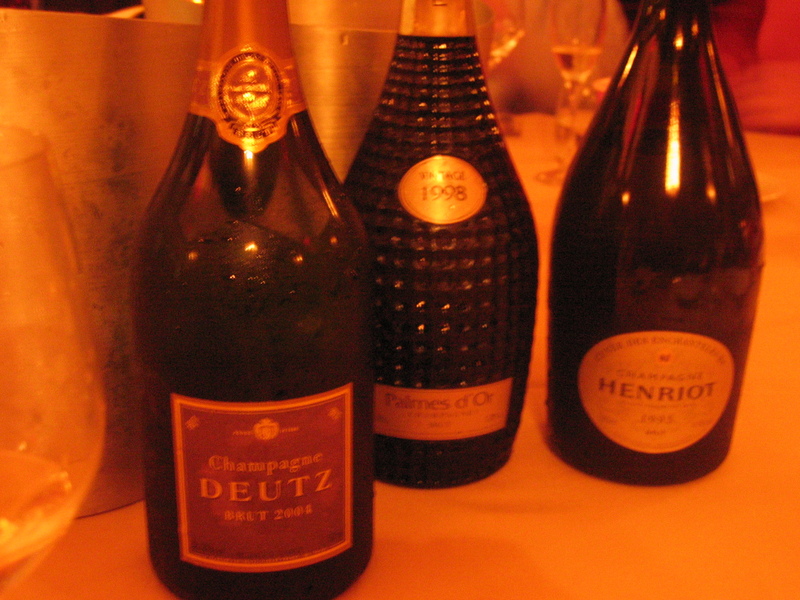 2004 Deutz Brut Classic, a third Chardonnay, a third Pinot Meunier and a third Pinot Noir ($65). This producer is not very well known in the United States but Ed likes it and feels it is a good buy. 2002 Taittinger “Millesime” Brut, Chardonnay and Pinot Noir ($70). It was very dry, needs more time and I think it will be a great wine. It is only made in very good years. 2003 Louis Roederer Brut, 65%, Pinot Noir and 35% Chardonnay. Ed said that 2003 was not a good year in Champagne but Roederer was one of the few that made a good wine. 1999 Laurent- Perrier Brut Vintage ,52% Chardonnay and 48% Pinot Noir ($60) I found it to be ripe and round with hints of preserved fruits. 2000 Charles Heidsieck, one third Pinot Noir, one third Chardonnay and one third Pinot Meunier. (($70) This was one of Ed’s top three and also one of mine. It is also underrated champagne. It was rich and elegant at the same time with very good fruit. 1999 Gosset “Millesime” Brut ($80). Mostly Chardonnay. Ed liked this one but said it needed more time–it was still too young. This is a very good small house and not very well known. 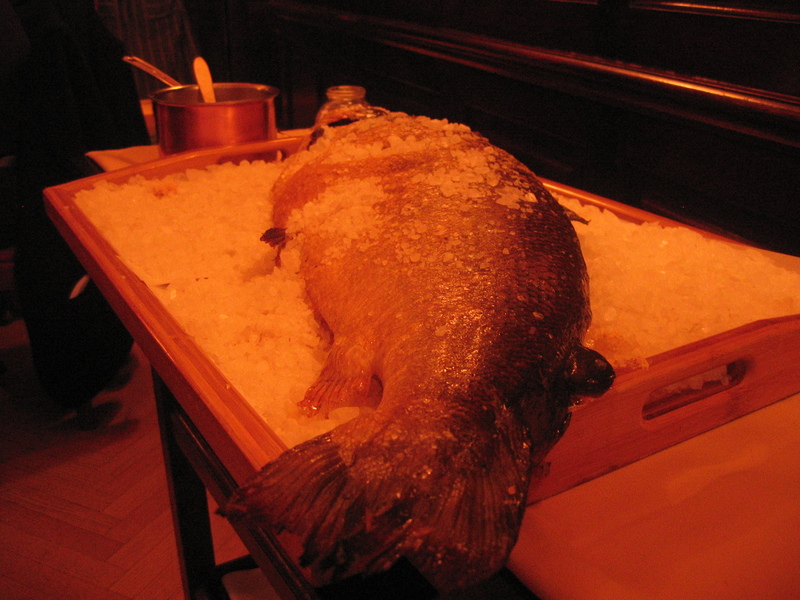 It does not undergo malalactic fermentation and goes very well with food. 1998 G. H. Mumm “Cuvee Rene Lalou” Brut Prestige Cuvee, Chardonnay and Pinot Noir ($150) This was the most expensive wine and the only one Ed believed was ready to drink now and would not get any better. 1999 Bolinger La Grande Anee Brut 63% Pinot Noir and 37% Chardonnay ($125) this was one of my top wines but Ed did not like it as much as I did. Both of us felt that it would age very well. 1995 Henriot “Cuvee des Enchanteleurs” Brut Prestige Cuvee. Mostly Chardonnay ($135) this is a big champagne, with hints of toast and a great finish and after taste. Ed and I had the same three top wines but when he was asked for a fourth he picked the Delamotte and mine was the Bollinger. He said that there are still a few champagne houses that do not make a blanc de blanc. Ed believed the 1996 was the best vintage of the last 20 years. 1988 was excellent and 1995 was very good. 1999 and2000 were good years. 2002 was an excellent year. 2003 was a very warm year and few producers made a good wine and 2004 was a very good year. 1998 was not that good of a year but some producers made very good wine. He said that 2002 was the vintage to buy now. Two weeks later I attended a NY Wine Press tasting and lunch of Prestige Cuvee Champagnes and once again Ed was the speaker. There were 13 champagnes. According to Ed, “Cristal 02, Pol Roger Sir Winston Churchill 98 and Ayala Cuvee Perle d’ Ayala Brute Natural were standouts”. I agree with Ed but other standouts for me were: the Henriot ‘Cuvee Des Enchanteteus” 1995 which was showing better than it was two weeks ago, Veuve Clicquot “La Grande Dame 1998, Gosset “Celebris“ 1998 and the Taittinger ‘Comte De Champagne’ Blanc De Blances Brut 1998. We all drank from tulip champagne glasses except for Ed who made them change his to white wine glasses! 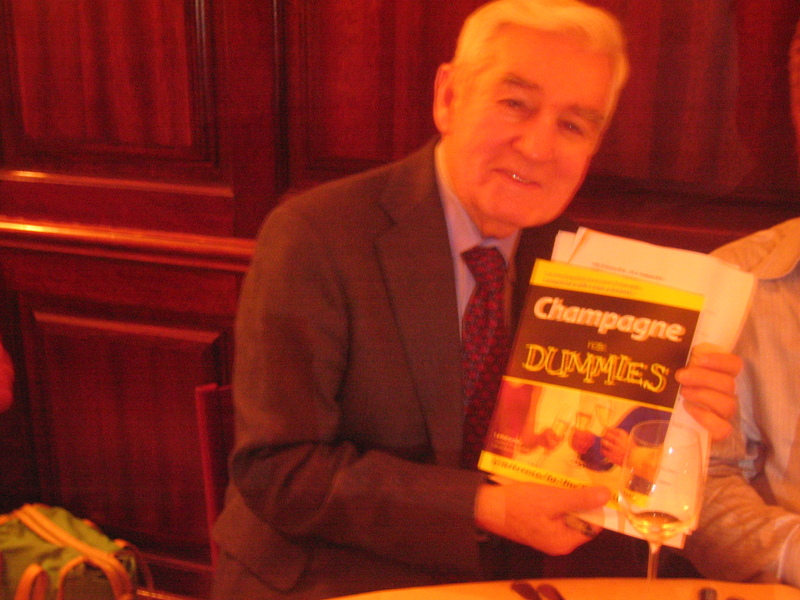 Ed with His Book "Champagne for Dummies"
Xavier Flouret of Cognac One, the importers of Ayala, was sitting at my table during lunch. I asked him what type of glass they use in Champagne. He said at dinner they would use a champagne glass but when they taste the wine in the cellar they use a white wine glass!